Welcome, come in to the 468th and 469th Carnival of Space – we combined these two since it’s summer break for a lot of folks! The Carnival is a community of space science and astronomy writers and bloggers, who submit their best work each week for your benefit. I’m Susie Murph, part of the team at Universe Today and CosmoQuest. So now, on to this week’s stories! Special Guest: Rebecca Roth, Imaging Coordinator & Social Media Specialist at NASA’s Goddard Space Flight Center; responsible for sharing imagery with the media, as well as sharing those images with the public, mainly through social media such as Instagram and Flickr. With just 12 days before Comet 67P/Churyumov-Gerasimenko reaches perihelion, we get a look at recent images and results released by the European Space Agency from the Philae lander along with spectacular 3D photos from Rosetta’s high resolution camera. Slow animation of images taken by Philae’s Rosetta Lander Imaging System, ROLIS, trace the lander’s descent to the first landing site, Agilkia, on Comet 67P/Churyumov–Gerasimenko on November 12, 2014. Remarkably, some 80% of the first science sequence was completed in the 64 hours before Philae fell into hibernation. Although unintentional, the failed landing attempt led to the unexpected bonus of getting data from two collection sites — the planned touchdown at Agilkia and its current precarious location at Abydos. After first touching down, Philae was able to use its gas-sniffing Ptolemy and COSAC instruments to determine the makeup of the comet’s atmosphere and surface materials. COSAC analyzed samples that entered tubes at the bottom of the lander and found ice-poor dust grains that were rich in organic compounds containing carbon and nitrogen. It found 16 in all including methyl isocyanate, acetone, propionaldehyde and acetamide that had never been seen in comets before. While you and I may not be familiar with some of these organics, their complexity hints that even in the deep cold and radiation-saturated no man’s land of outer space, a rich assortment of organic materials can evolve. Colliding with Earth during its early history, comets may have delivered chemicals essential for the evolution of life. Ptolemy sampled the atmosphere entering tubes at the top of the lander and identified water vapor, carbon monoxide and carbon dioxide, along with smaller amounts of carbon-bearing organic compounds, including formaldehyde. Some of these juicy organic delights have long been thought to have played a role in life’s origins. Formaldehyde reacts with other commonly available materials to form complex sugars like ribose which forms the backbone of RNA and is related to the sugar deoxyribose, the “D” in DNA. ROLIS (Rosetta Lander Imaging System) images taken shortly before the first touchdown revealed a surface of 3-foot-wide (meter-size) irregular-shaped blocks and coarse “soil” or regolith covered in “pebbles” 4-20 inches (10–50 cm) across as well as a mix of smaller debris. Agilkia’s regolith, the name given to the rocky soil of other planets, moons, comets and asteroids, is thought to extend to a depth of about 6 feet (2 meters) in places, but seems to be free from fine-grained dust deposits at the resolution of the images. The 16-foot-high boulder in the photo above has been heavily fractured by some type of erosional process, possibly a heating and cooling cycle that vaporized a portion of its ice. Dust from elsewhere on the comet has been transported to the boulder’s base. This appears to happen over much of 67P/C-G as jets shoot gas and dust into the coma, some of which then settles out across the comet’s surface. Another suite of instruments called MUPUS used a penetrating “hammer” to reveal a thin layer of dust about an inch thick (~ 3 cm) overlying a much harder, compacted mixture of dust and ice at Abydos. The thermal sensor took the comet’s daily temperature which varies from a high around –229° F (–145ºC) to a nighttime low of about –292° F (–180ºC), in sync with the comet’s 12.4 hour day. The rate at which the temperature rises and falls also indicates a thin layer of dust rests atop a compacted dust-ice crust. CONSERT, which passed radio waves through the nucleus between the lander and the orbiter, showed that the small lobe of the comet is a very loosely compacted mixture of dust and ice with a porosity of 75-85%, about that of lightly compacted snow. CONSERT was also used to help triangulate Philae’s location on the surface, nailing it down to an area just 69 x 112 feet ( 21 x 34 m) wide. In fewer than two weeks, the comet will reach perihelion, its closest approach to the Sun at 116 million miles (186 million km), and the time when it will be most active. Rosetta will continue to monitor 67P C-G from a safe distance to lessen the chance an errant chunk of comet ice or dust might damage its instruments. Otherwise it’s business as usual. Activity will gradually decline after perihelion with Rosetta providing a ringside seat throughout. The best time for viewing the comet from Earth will be mid-month when the Moon is out of the morning sky. Watch for an article with maps and directions soon. “With perihelion fast approaching, we are busy monitoring the comet’s activity from a safe distance and looking for any changes in the surface features, and we hope that Philae will be able to send us complementary reports from its location on the surface,” said Philae lander manager Stephan Ulamec. OSIRIS narrow-angle camera image showing the smooth nature of the dust covering the Ash region and highlighting the contrast with the more brittle material exposed underneath in Seth. More about Philae’s findings can be found in the July 31 issue of Science. Before signing off, here are a few detailed, 3D images made with the high-resolution OSIRIS camera on Rosetta. Once you don a pair of red-blue glasses, click the photos for the high-res versions and get your mind blown. Mosaic of two images showing an oblique view of the Atum region and its contact with Apis, the flat region in the foreground. This region is rough and pitted, with very few boulders. Image highlighting an alcove structure at the Hathor-Anuket boundary on the comet’s small lobe. The layering seen in the alcove could be indicative of the internal structure of the comet. Special Guest: This week we welcome Paul Sutter, the CCAPP Visiting Fellow who works on the cosmic microwave background and large-scale structure. Fantastic news! Philae’s alive and kicking. 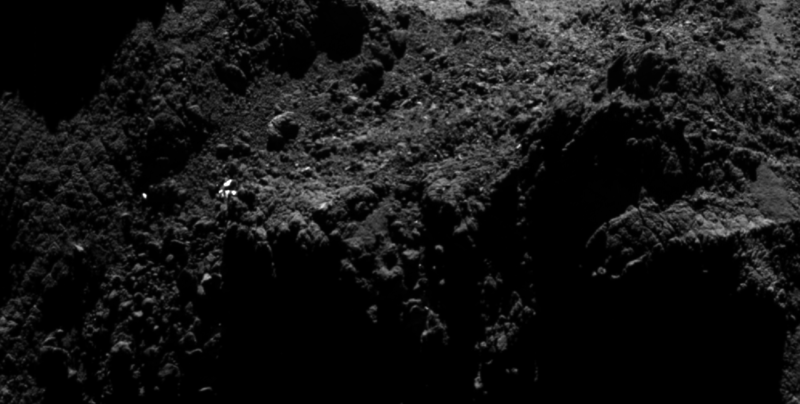 The lander “spoke” with its team on ground via Rosetta for 85 seconds — its first contact since going into hibernation in November. Signals were received at ESA’s European Space Operations Center in Darmstadt at 4:28 p.m. EDT yesterday June 13. The lander sent more than 300 data packets reporting on its condition as well as information about the comet. If coming out of hibernation isn’t surprising enough, it appears Philae has been awake for a while because it included historical data along with its current status in those packets. There are still more than 8000 data packets in Philae’s mass memory which will give the mission scientists information on what happened to the lander in the past few days on Comet 67P/C-G.
Philae shut down on November 15 after about 60 hours of operation on the comet after landing at the base of a steep cliff in a shaded area that prevented the solar panels from charging its batteries. Since March 12, the Rosetta lander has been “listening” for a signal from the lost lander. Throughout, mission scientists remained hopeful that the comet’s changing orientation and increase in the intensity of sunlight as it approached perihelion would eventually power up the little lander. Incredible that it really happened. Yesterday, we looked at the many attempts to find Philae. A day later it’s found us! “Hurrah! Hurrah! Hurrah! Landing probe Philae awake! Everybody, please accept my sincere congratulations! It happened on 13 June 2015 in the day of birthday of my mother – Antonina Mikhailovna (108 years have passed since the day of her birth). And I’m starting from 13 November 2014 to this day, every morning pronounced a short prayer: “Lord, please wake Philae and support Rosetta”. God and the Professional Navigators woke Philae! It is fantastic! All the best! – Klim Churyumov. How poignant Philae awoke on Klim’s mother’s birthday! Churyumov made his statement on the Pro-Am Collaborative Astronomy (PACA) site devoted to pro-amateur collaboration during comet observing campaigns. I encourage you to check out the group and participate by submitting your own observations of Comet 67P as it brightens this summer and early fall. * UPDATE: In the coming days, the mission teams will reestablish contact with Philae and increase the amount of time it can “talk” with the lander. Once regular contact is established, science observations can begin again. Slowly. One instrument at a time. The first instruments activated, those measuring temperature, magnetic fields and electrical conductivity on the comet, make small demands on Philae’s power. Slightly more power-hungry operations like picture taking and radio ranging will follow. Using the images and new data, scientists should be able to pinpoint the lander’s location. After these steps, mission engineers will attempt to recharge the probe’s drained batteries to fire up its ovens (used to heat samples to determine their composition) and run the drill to collect fresh material. Here’s a cool link to see LIVE telemetry from Philae. Work Platform to be Installed in the Vehicle Assembly Building at NASA’s Kennedy Space Center in Florida.